Brother and sister “had no idea” 18th century porcelain piece owned by late uncle would break auction record. IT’S A DEAL telly antiques dealer David Dickinson would be proud of. A Chinese porcelain vase which had been estimated to fetch up to €1.4m at auction for a brother and sister who found it when they cleared out their dead uncle’s house has actually sold for €50m (£43m sterling). The siblings discovered the highly-decorative blue and yellow vase among their late uncle’s possessions when they inherited his bungalow upon his death. They “had no idea what they had”, Helen Porter from Bainbridges auction house in Middlesex, England told BBC News. 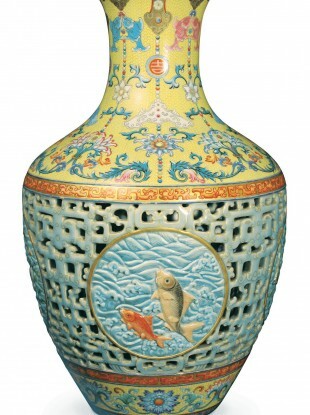 The vase is 16 inches high with an intricate perforated pattern and handpainted fish motif. Ivor Macquisten, editor of Antiques Trade Gazette, said it would have been made for the Qianlong emperor between the mid to late 18th century and that there had been a “queue of dealers and collectors” to see the vase. The winning bid came from a private buyer, believed to be from China. He was the emperor in China when China was at its zenith, effectively creating the empire you see today. And this is one of the great works made for one of his palaces. The record (for auction prices of Chinese vases) was actually broken about two weeks ago by Sothebys in Hong Kong when another vase sold for £18.2m (€21.3m). Talk was this vase could have made up to £20m (€23.4m) but a lot of people didn’t even believe that. They were hopeful but they didn’t dare believe until the hammer went down. When it did, the sister had to go out of the room and have a breath of fresh air. Email “Chinese vase found in house clearance nets €50m”. Feedback on “Chinese vase found in house clearance nets €50m”.